…I’ve just been following and participating in an interesting thread on a readers group page, the splendid Bookshop Cafe Group, on Facebook about preferences for print versus eBooks and the respective pricing for these… in truth, that kinda discussion has been going on since ever I’ve been a self-publishing scribbler, which is almost a decade now… I think I’ve seen the tide of opinion flow from the, ‘I’ll never give up reading REAL books I can touch and smell’ comments to a more balanced, ‘a book is a book in whatever format it comes’… of course, there are many who will only read a printed tome… and lotsa folks who don’t own a Kindle, nor feel inclined to download its free app to whatever electronic device they use… and their choice should be respected… as a reader myself, as well as being a writer, I recall the last time I purchased a printed book was more than 8 years ago, but I’ve bought and downloaded loads of books in the interim, having once claimed to be a ‘dyed-in-the-wool’ adherent to reading only print copies… I’m squarely in the camp of those who recognize an author’s labours as legitimate, regardless of the format in which they publish their literary masterpieces… the other chestnut is the argument of some writers who, ‘will never give away any of their books free’… I can well understand the reluctance to yield up gratis the babies they have produced with blood, sweat, tears, and computer ink… from my perspective, I DO indulge the Auntie Amazon free promos occasionally, but I am fortunate to have a back list which remains at full pricing while the free title ‘does its thang’… invariably it generates sales/downloads on the non-freebies… in point of fact, I’ve just recently done one such five-day promo, which saw a healthy take-off on the free book, accompanied by satisfactory sales on its siblings… coincidentally, it also perked interest for all my titles on the KINDLE UNLIMITED feature, which generates more page-read income for authors… I hope that’s of some interest and help to my fellow Lads and Lassies of Blog Land… see yeez later… LUV YEEZ! 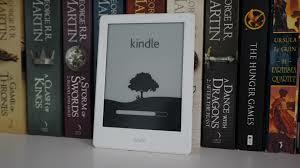 Here is a great post from Seumas Gallacher on the positives and negatives of the Kindle. Seumas’ viewpoint on ebooks versus printed books.